A little more than four and a half billion years ago, the newly forming Earth was involved in a violent celestial collision with a smaller protoplanet—half the size of our planet or the size of Mars. The debris from the mammoth event was launched into space, formed a ring of fiery debris around the Earth that coalesced in about a year to form our Moon. This off centre collision knocked our world on its side as demonstrated with any classroom globe. In our yearly orbit around the Sun, this tilt allows us to experience longer and shorter daytime hours hence, the seasons. All eight planets of our solar system have a tilt to varying degrees. Aside from summer, the spring equinox is the most celebrated season as we say goodbye to bone chilling winter and plan for warmer weeks ahead. The word “equinox” is derived from the Latin meaning (equal night). From now till June 21, daytime hours lengthen but the night hours shorten. The opposite occurs in the earth’s southern hemisphere as it is now their fall equinox moving into winter. 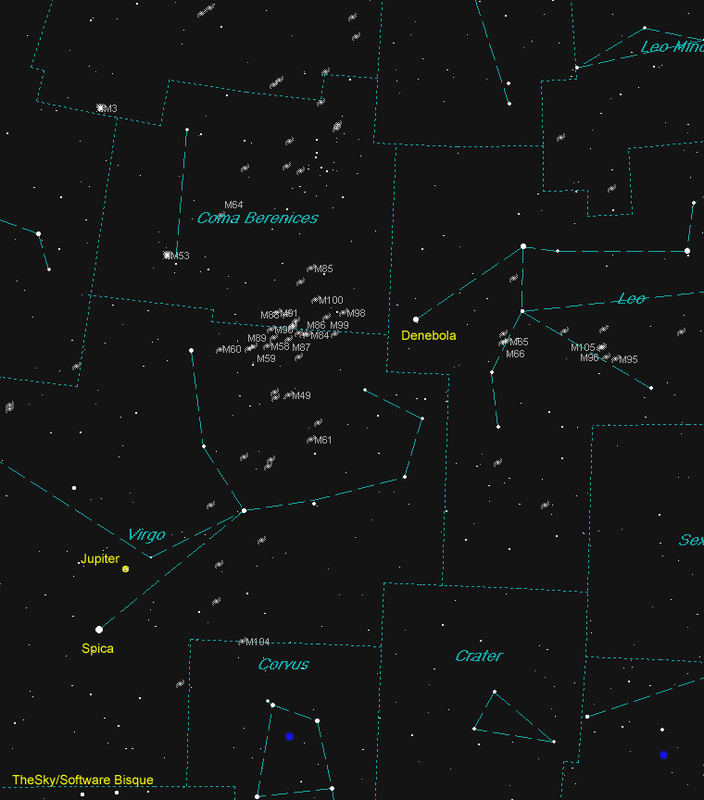 Although Orion the Hunter and the other winter constellations are setting earlier in the west, this is still a great time to view the objects I have recently written about. 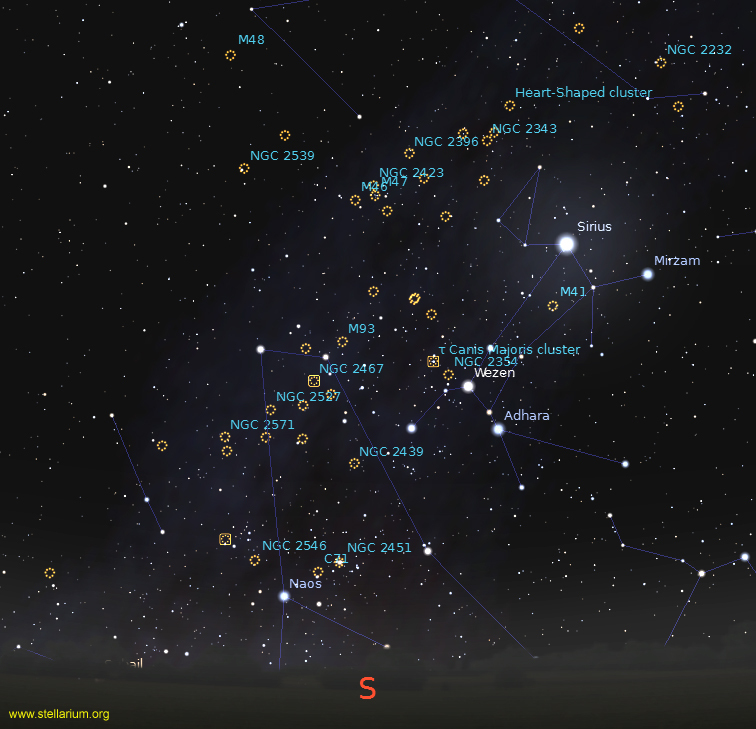 On a moonless night, bring out you trusty binoculars and scan the 15 or so open star clusters located from the left of the bright star Sirius down along the Milky Way to the horizon. Moving east of the Gemini Twins is a huge open cluster of about 40 stars you can see without optical aid from dark locations such as the pristine and dark skies of Northeastern Ontario. Located in the constellation Cancer the Crab, the Beehive Cluster is located 577 light years away and occupies the area of three full moons side by side. 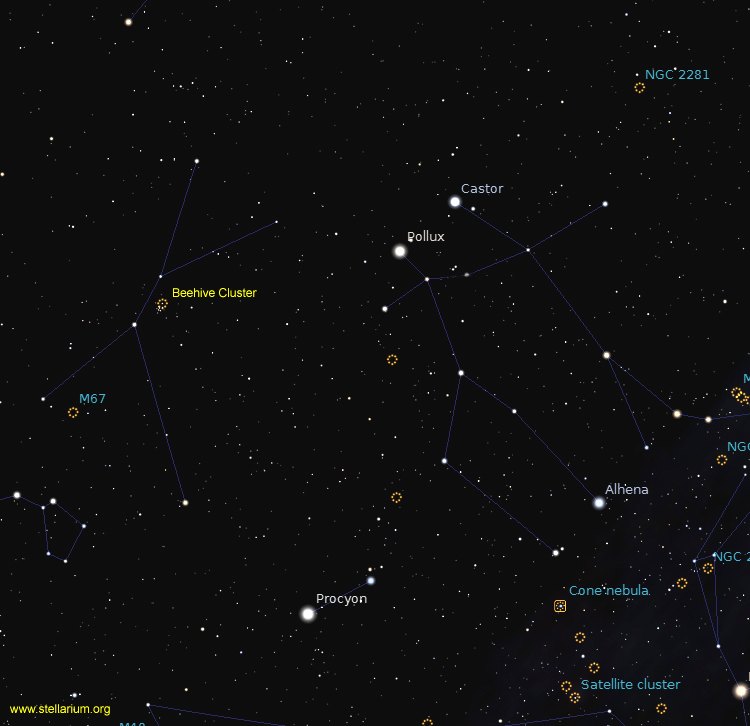 There are more than 200 stars associated with the Beehive when seen through a telescope. 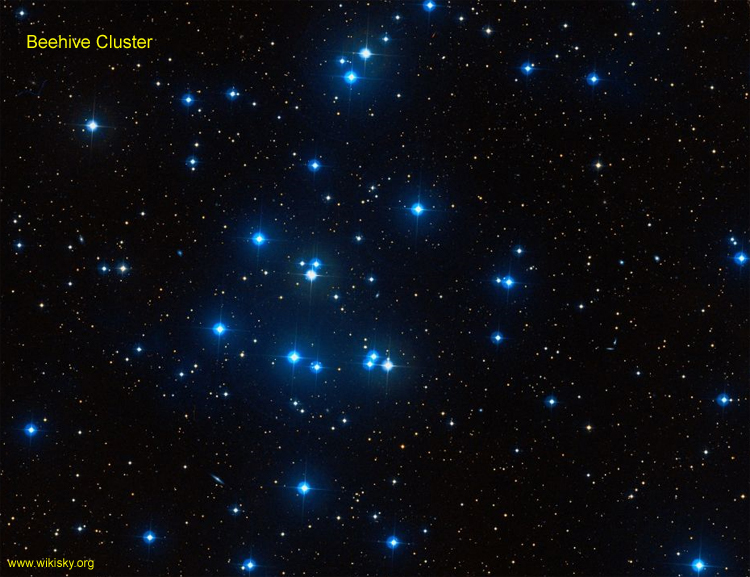 Try setting up a DSLR camera on a tripod to capture this cluster. 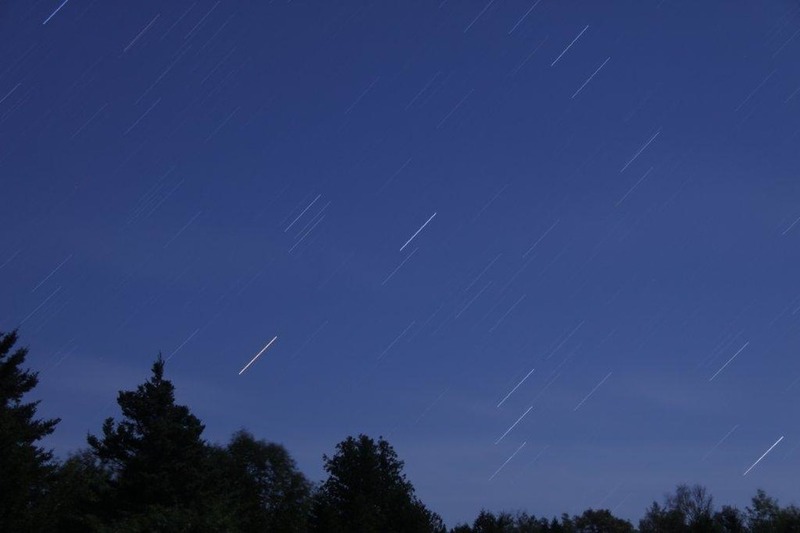 Set your lens and camera on manual mode and carefully focus the lens to pinpoint stars. Select the highest ISO setting (light sensitivity) and expose for a few seconds. Change exposure time if needed. Remember pixels are free so have fun experimenting. Look up, way up to the iconic constellation Ursa Major; commonly know as the “Big Dipper.” Appearing as a pot, Ursa Major is a circumpolar constellation meaning it never sets and can be seen any time of year from Canada. The front two stars of the bowl are called the “pointers” and by drawing an imaginary line through the two leads to our North Star—Polaris. Also use the Dipper as a guide to other constellations. For example if this imaginary pot had water and you pierced a hole at the bottom, it would land on the back of Leo the Lion. The beast is outlined by a backwards question mark (lion’s head) and an isosceles triangle to the left (rest of its body). The bright star at the bottom of the question mark is called Regulus which measures four and a half times wider and 360 times brighter than our Sun. It spins once in 16 hours compared to the Sun’s 25 days. 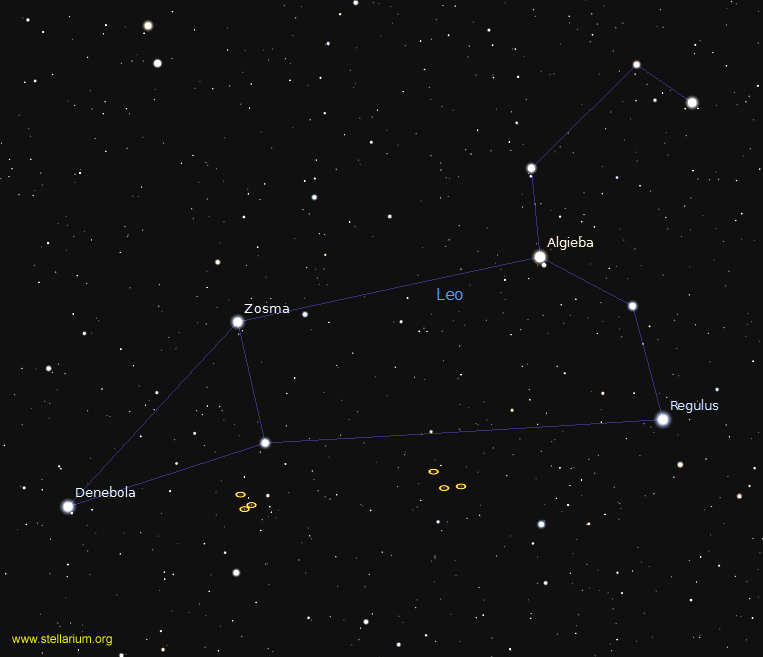 Move to a lovely double star called Algieba located 131 light years away. The pair comprises of a brighter orange and dimmer yellow sun. The yellow star takes an estimated 510 years to make one revolution around the primary which is referred as Gamma 1 and has a planet orbiting it. Yet another example of a naked eye star with a distant world around it. Astronomers also refer to this time of year as galaxy season. Remote islands of stars like our Milky Way are located all over the night sky. Like star clusters, some galaxies form in groups or clusters as they gravitationally attract each other. The greatest gathering is called the Virgo cluster where a few dozen galaxies reside in the 60 million light year range from us. Even through the powerful magnification of a telescope, most are faint. Still, it is the challenge on finding distant objects in which their light has been travelling almost as long as when the dinosaurs became extinct. I have seen galaxies estimated to be 250 million light years from us or that period of time our planet was one large land mass called Pangea before the continental drift. The brilliant “king” of the planets, Jupiter rises in the east at 9:30 p.m. local time and is out all night long. A telescope will reveal its cloud layers and the four Galilean moons. The bright star below Jupiter is Spica. At 250 light years away Spica has an extremely close companion star that cannot be seen in a telescope. Both orbit each other in a little more than four days.